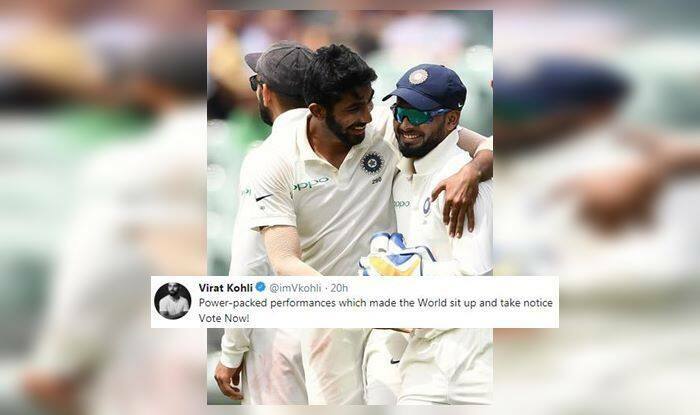 Indian Sports Honours: India captain Virat Kohli urged fans to vote for Rishabh Pant and Jasprit Bumrah in the India Sports Honours. Meanwhile, Bumrah picked up 48 wickets in Test cricket in 2018 and was one of the biggest reasons for India’s recent success Down Under. Bumrah also won accolades from legends like Michael Clarke and many others. The 25-year-old speedster is set to play a key role in the upcoming ODI World Cup for India, on the back of consistent performances in the recently concluded away tour of Australia. Bumrah was the joint-highest wicket-taker in the historic 2-1 Test series triumph against Australia with 21 wickets and was recently rested for the ODI series against the same opposition as well as the recently concluded tour in New Zealand. Pant, on the other hand, has been in prime form for India in recent times, emerging as the second highest run-scorer in the Test series against Australia with 356 runs. He further made his presence felt with a breathtaking 159 at Sydney, emerging as the first Asian wicketkeeper to score a century in Australia. The 21-year-old cricketer delivered more of the same during the T20I series against New Zealand, cementing his reputation as a talented wicket-keeper capable of winning matches singlehandedly in the World Cup.